Stitch 'n Dish | What's being made in the kitchen, and on the needles. Since my niece is just going to be one next month, I doubt she’ll be surfing the web to see what her aunt is sending her for her birthday. There now exists an entire “Snuggle Bear” collection. If you are interested in seeing the details of how they are made, you can read them on a previous post Assembly of a Bear. Both of my children have Snuggle Bears, and love them. My son, who is three, carries his around the house routinely, and when my daughter was having difficulties adjusting to kindergarten her Snuggle Bear went to school in her backpack because he was “full of Mommy love.” When I asked my children what they wanted to send their cousin for her first birthday, Chase asked, “Does she have a Snuggle Bear?” When I told him she did not, he insisted she must have one. 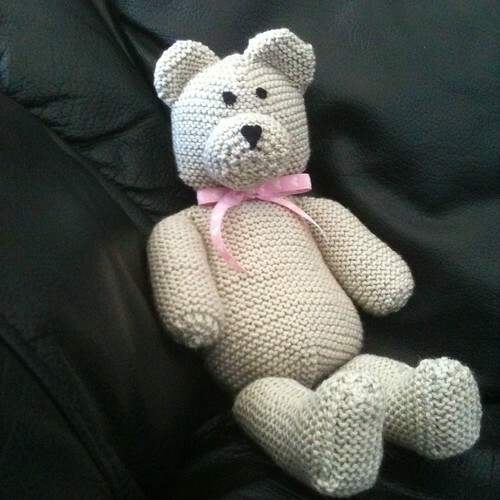 So, I hope she likes Snugs – he was made with lots of love. The yarn used is Rowan RYC Cashsoft DK in a soft gray color 00515. Last Wednesday it was my birthday, and a friend took me over to the fabric store to do some shopping. 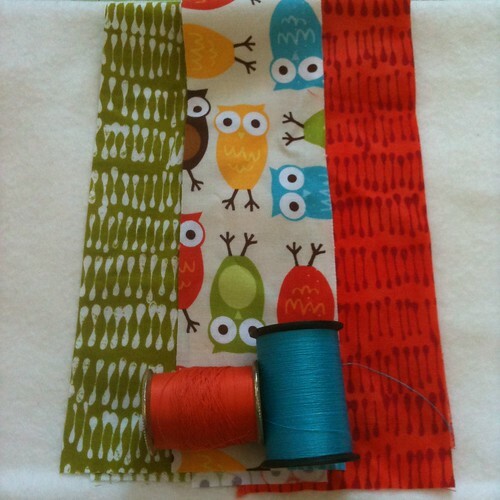 I went with a project in mind, a playmat that I had seen on the Purl Bee, that I wanted to make for a friend of mine who is expecting a baby; however, when I walked into the store the first thing I saw was this adorable owl fabric that perfectly matched the nursery of a different friend’s baby. So I left that day with supplies to make two playmates. 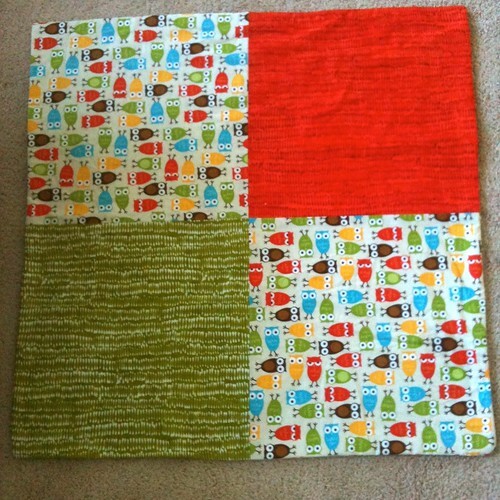 Since Ethan, the inhabitant of the owl-themed nursery has already been born, I made his mat first, and loved the result. For those of you who are local, all supplies were purchased at Thimble Pleasures in Chapel Hill. I love that store. 1. Turn broiler on high. Place raw, chopped bacon in a cast iron skillet over medium heat. 2. While bacon starts to cook, chop onion and cut asparagus into smaller pieces. 3. Add onion to the bacon, and continue to cook until the onion becomes translucent. While the onions cook, beat the eggs in a large bowl with some salt and pepper. 4. Add the asparagus to the onion and bacon in the skillet, and stir a few times until well mixed. Add the eggs and sprinkle in the cheese. Stir a few times, then place the skillet into the oven. 5. 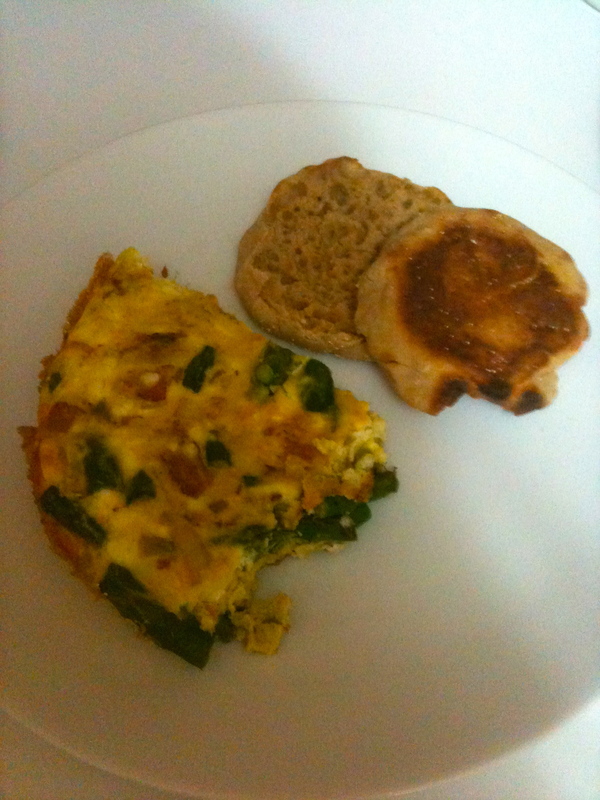 Allow the frittata to cook for 5 minutes, or until it becomes puffy and fully cooked. Remove the frittata from the oven and let it cool for 5 minutes. Serve with an English muffin, fresh fruit, or your favorite breakfast potatoes. This is the best thing that has come out of my kitchen in a while. It is delicious. I’ll be up front and honest with you, cutting up a butternut squash is no easy task, but it is worth it. Count all your fingers. Congratulations if you still have them all! I am convinced every time I slice up one of these squashes I am going to lose a finger. If you have done it before, you know what I am talking about. If you haven’t you just probably think I am crazy. That is okay, I probably am. Better yet, if you can find a bag of pre-cut squash, go that route. I think I have seen it at Trader Joe’s before. with some chunked apples and walnuts (I’m assuming you know how to peel and chop an apple). I used one large Honeycrisp apple. It was divine. Now you are going to want to melt 3 to 4 tablespoons of butter, or if you are like me and realize you have no butter or are vegan, Earth Balance in the microwave just until it melts. Pour it all over the squash, apples, and nuts in the bowl along with some brown sugar, and dump it on a large baking sheet. Sprinkle it with some cinnamon and bake this wonderful mixture in the oven at 350 degrees for about an hour until it becomes soft. Tonight it took an hour and 10 minutes in my oven. I have no idea why. Serve it over some long grain brown rice, and enjoy. 1. Pre-heat the oven to 350 degrees. Clean, seed, and chop the squash and apple up into cubes. 2. Mix the squash, apples, walnuts, sugar, and butter together in a large bowl. 3. Pour it on a large baking sheet, sprinkle with cinnamon, and bake for 60-70 minutes. 4. While the squash cooks, make some brown rice. 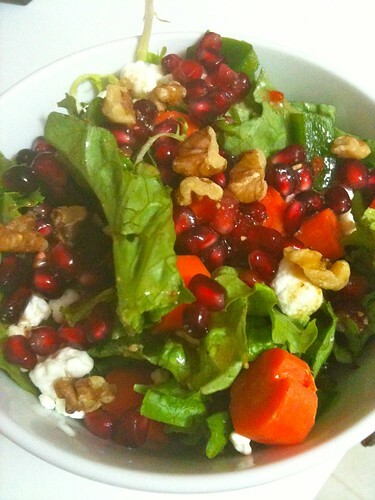 I have really been loving this salad ever since I stumbled upon the ready-to-use pomegranate seeds at Trader Joe’s. The sweetness of the pomegranate juice and the savory flavors of Italian dressing are delicious with the creamy goat cheese and crunchy walnuts. 1-2 Tbs each optional ingredients such as green pepper, carrot, or mushrooms. Toss all ingredients in a bowl and enjoy. There was entirely too much turkey left in the house after Thanksgiving. We ate leftovers multiple meals in a row, then I got creative. These enchiladas were an easy, delicious way to use up some of the extra turkey. I started by mixing about two cups of shredded turkey, some low-fat sour cream, and low-fat Mexican cheese blend (Trader Joe’s). Next place about a quarter to half cup of the mixture in a large flour tortilla. Place them in a large baking dish, cover with more enchilada sauce, and cheese. The reason for the foil in this picture is that my kids don’t like the spicy enchilada sauce, so the two lonely roll-ups on the end are for them. Bake the enchiladas for about 20 minutes at 350 degrees, or until all the cheese is melted. Once I placed them on the plate, I drizzled even more sauce over the top, and served them with tortilla chips and salsa. I also think a black bean and corn side would be excellent. 1. Pre-heat oven to 350 degrees. Mix turkey, sour cream, and 1 cup of cheese in a medium-sized bowl. 2. Place 1/4 to 1/2 cup of turkey mix into a tortilla. Drizzle enchilada sauce over the turkey mixture and wrap up, closing both ends. 3. Place all enchiladas in a large, shallow baking dish and cover with enchilada sauce and remaining cheese. 4. Bake for 20 minutes, or until cheese is melted. This year we spent Thanksgiving with two of our friends who are vegan. Last year I made a vegan pumpkin pie that called for tofu which did not impress me much. This year, I decided to try something new, and it was delicious. So delicious, in fact, that I only ate the vegan pie this year. To start make a crust. I always make the Crisco Crust with butter flavored Crisco. The recipe can be found here. I like it better than any of the Earth Balance crusts that I’ve tried. For the filling, use two cups of fresh roasted pumpkin puree. Canned pumpkin can be used, but after having used fresh pumpkin, I’m all about roasting pumpkins for puree. I did not take any pictures of this pie, which is too bad, because it was beautiful. Guess you will just have to try to make it and see for yourself. 2. Combine the pumpkin, milk, sugar, cornstarch, and spices together with an electric mixer. 3. Pour into the uncooked pie crust and bake for 60 minutes. 4. Allow pie to cool completely to room temperature before covering with plastic wrap. Place in the refrigerator over night. Each time I make this recipe I feel as if I won the lottery. The effort required to make this dish is very little for the amount of delicious goodness that is the end result. Because of this, it has become my go-to recipe when I do not know what is for dinner. Oh, and did I mention that it is good for you, too? 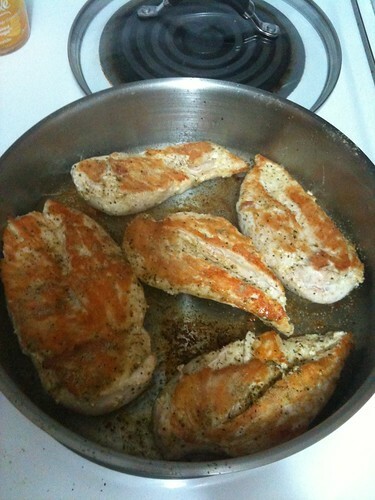 To start, spray a skillet with non-stick cooking spray, I use the Target brand olive oil kind, and start cooking some boneless, skinless chicken breast. 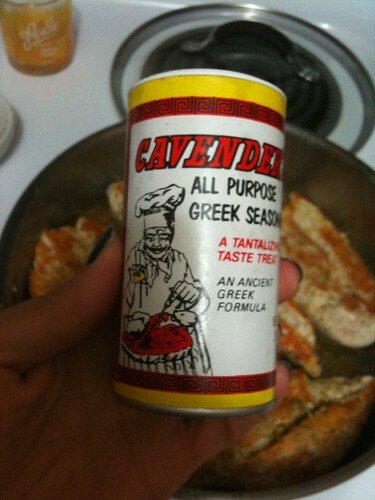 I sprinkled these with salt, pepper, and Greek seasoning. 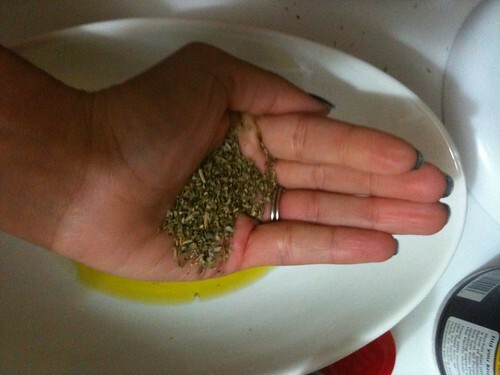 This was the first time I used Greek seasoning, and now I put it on everything. 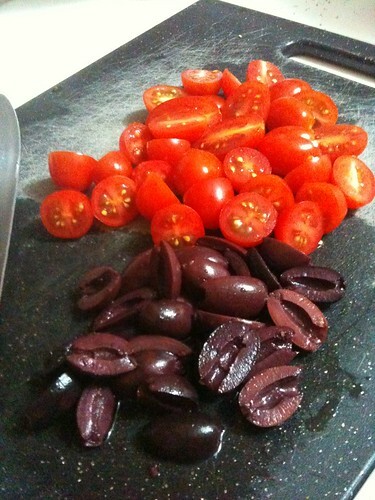 While the chicken cooks, slice some cherry tomatoes and pitted kalamata olives in half. Flip the chicken when it is nice and brown on the bottom, about five minutes. While the second side of the chicken cooks mix olive oil, balsamic vinegar, salt, pepper, and Italian seasoning in a bowl. 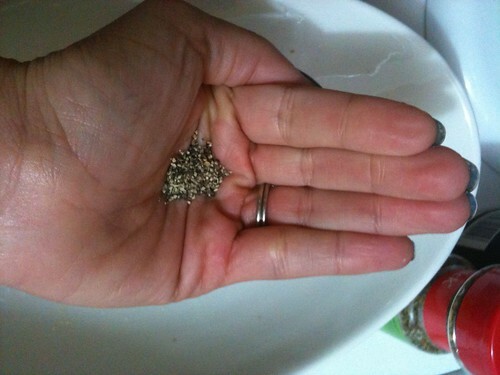 Yes this really is how I measure most of my seasonings when I am cooking. If time is an issue, any store-bought balsamic vinaigrette would work wonderfully. Toss the tomatoes and olives in the dressing. Once the chicken is completely cooked, put it on a plate, top it with the tomato-olive mix (drain any excess dressing), and sprinkle with some feta cheese. Serve with some broccoli, couscous, or any side of your choice. Enjoy! 1. Heat a skillet with some non-stick cooking spray. 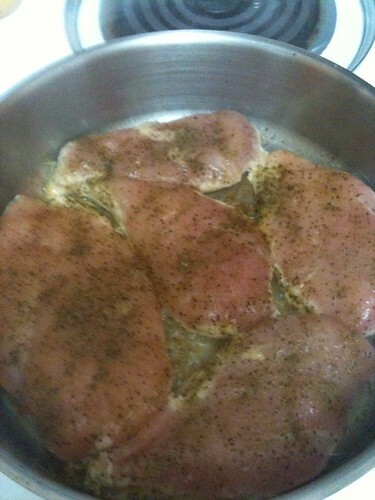 Sprinkle chicken with salt, pepper, and Greek seasoning. Start to brown chicken in skillet. 2. While the chicken cooks, slice the tomatoes and olives in half. 4. 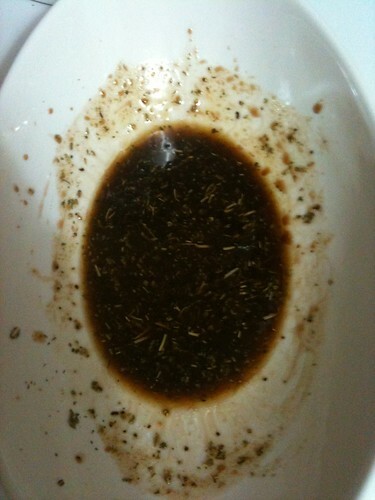 Mix olive oil, balsamic vinegar, salt, pepper, and Italian seasoning in a separate bowl. 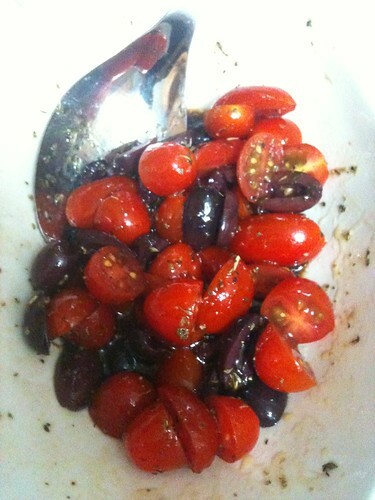 Toss the tomatoes and olives in the dressing. 5. 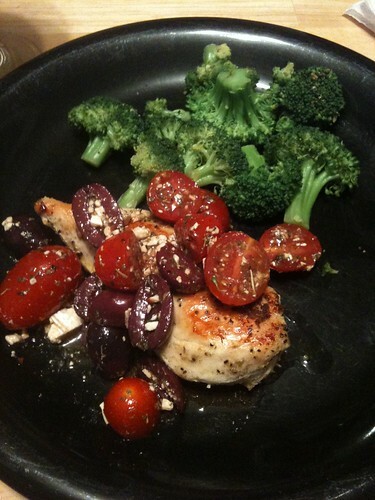 When chicken is finished cooking (about 5 minutes per side) put it on a plate, and top with 1/4 of the tomato-olive mix. Sprinkle with feta cheese, and enjoy. I have had several requests for my sugar cookie recipe lately. Although it has been a while since I have made them, and have no pictures to go along with this post, I wanted to share the recipes that I use. In a mixing bowl, cream butter with sugar until light and fluffy. 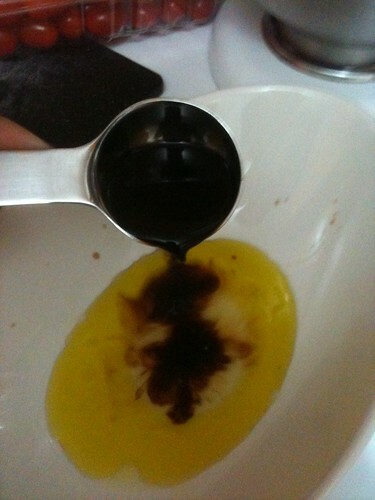 Beat in the egg and extracts. Mix flour, baking powder, and salt; add to the butter mixture 1 cup at a time, mixing after each addition. Roll dough out to 1/8 of inch thick and cut out cookies. Bake on un-greased cookie sheet for 6-7 minutes. Allow to cool 2 minutes on the cookie sheet before moving to foil to cool completely. Add the dry ingredients first. Use your mixer’s whisk attachment to incorporate the sugar and meringue powder. 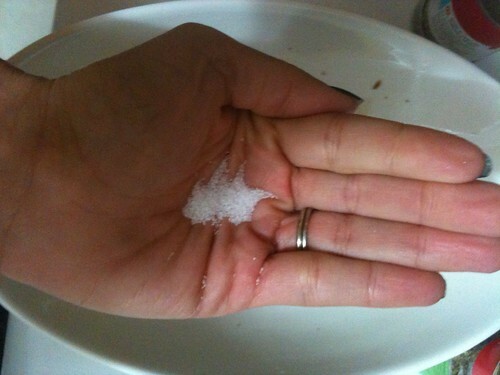 Add the extract to the water and slowly add it to the dry ingredients while mixing. At first the icing will be very liquid-like. Continue to mix it at medium-high speed until it is fluffy and stiff peaks form, about 7-10 minutes. Mixing times are approximate, keep your eye on the icing and stop mixing as soon as it becomes stiff. Over mixing and oil-containing extracts can keep the icing from setting up, so keep this in mind as you work. This recipe makes enough icing to decorate at least 9-10 dozen cookies. Royal icing will keep at least a month. I prefer refrigerating it, but it can also be left at room temperature. For coloring and decorating the icing, I use the Wilton gel colors, Wilton bags, tips, and bottles. They can all be found at any craft store (mine are from Michael’s). I get many of my decorating ideas from reading Sweet Sugar-Belle’s blog. It has been a long time since my last post. In January I began taking two classes at UNC Chapel Hill, medical microbiology and statistics, and volunteering at UNC Hospitals a few hours a week. These new activities have left me little time for blogging. Also, if I’m being completely honest, my husband gave me Dragon Age for Christmas and anytime I find that hasn’t been spent on child rearing, volunteer work, or school has been spent playing this game. I am still cooking, running, and knitting, however nothing has been too interesting. Although my new activities have been exciting, especially volunteering, they don’t exactly fall into the subject matter of this blog. I do currently have a fun item on my needles, and one in the queue. With a bit of dedication, I should have something to share with you soon.